Celebratory events such as Labor Day acknowledge the tough grinds individuals have performed whether it is for personal or family reasons. With their long hauls have improved an industry and propel them to their set vision and goals. In this case, one of the best ways to celebrate and promote labor day is through the use of design. The latter has a wide reach in its promotion of different products and in conveying in message. Down below, we have gathered a mighty fine selection of Labor Day banners which will be helpful for design projects such as online promotion & advertising, reference for graphic & digital art and so on. You may also go through our list of Labor Day Party Flyers. Selection of Labor Day Banners. Let the celebratory event be known with the use of labor day banners. Scroll down below to view on our list of labor day banner options. A common representation of Labor Day are of architectural development and assemblies but this specific banner showcases other industries and platforms, specifically, Military and Artistic fields. 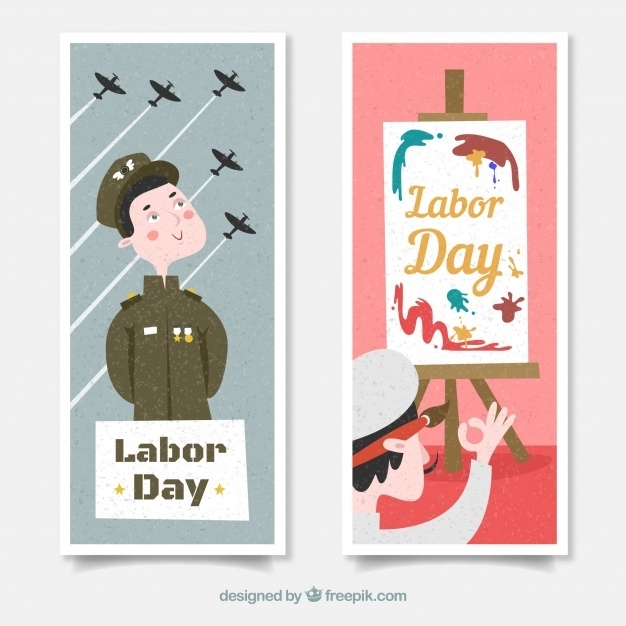 The Labor Day banners for Soldiers and Painters, subjectively, brings about fulfillment and the sense of happiness. In terms of design, the digital art offers a simple and textured appearance. As well as a direct conveying of message of the various fields. 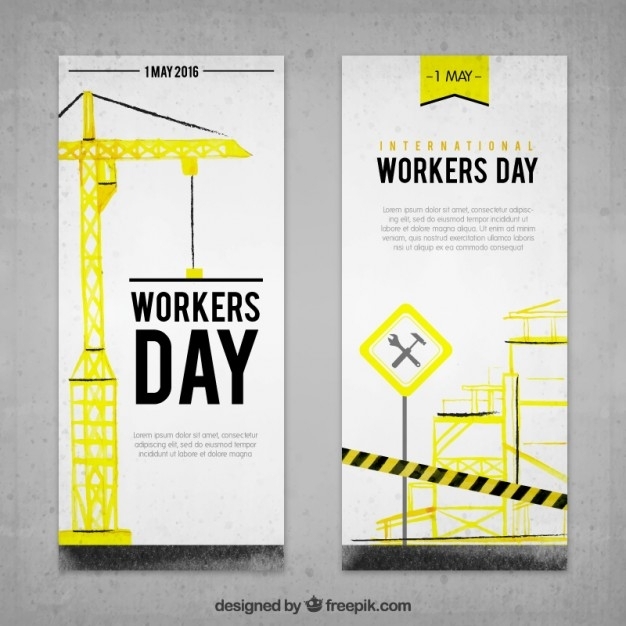 Set in a watercolor medium, the International Workers Day Banner mixes both digital and traditional tools to craft a celebratory banner. You may utilize the latter for online advertising, physical print, outdoor advertising and so on. 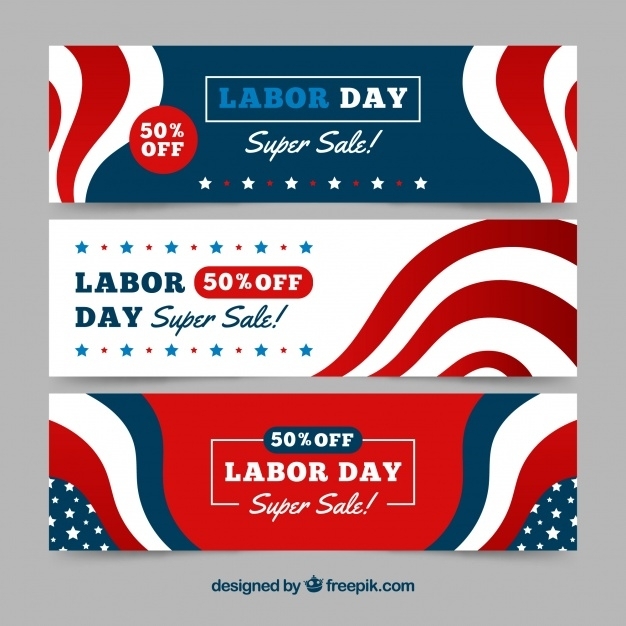 If you are looking for a cohesive design for your banners, the Labor Day Abstract Promotional Banners is a great selection. It brings about an exciting and festive appearance perfect for advertising. These banners comes in three variations all with a connecting abstract design. The aforementioned may be used for outdoor advertising as well as for online advertising such as social media promotion etc. 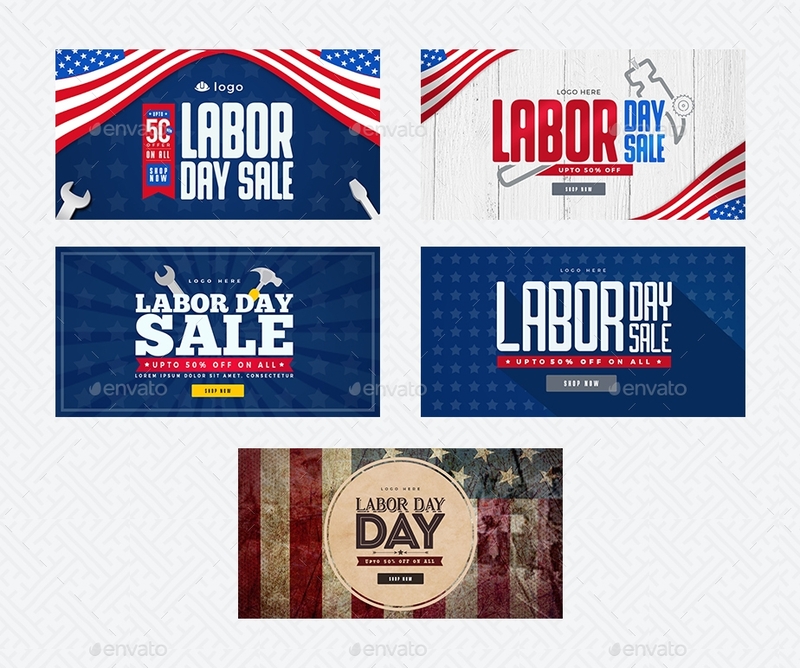 The Labor Day, Social Media Pack, comes along with five variations for its banners. Which are set for various social media sites be it Facebook, Twitter, Instagram and so on. This specific pack is easily customizable for text placement and so on. Creative Labs are known for the good quality brought about their sound equipment. It is best to strategize promotions to celebratory events and in this case, Labor Day, to do just that. 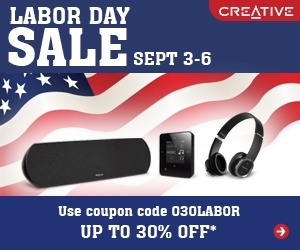 These Labor Day Sale banners for Creative labs offers five variation and sizes of their designs to fit different web layouts. This is one great reference for branding since it did emphasize on both the event and the product. As well as with enough information to entice viewers. It is important to add call of action elements to online banners to easily redirect users and viewers to the sales mechanic or the official website. With four variations available, you have plenty to utilize be it for design projects, mood board, prototyping, promotions and many more. The overall design demonstrates cohesiveness in terms of the application of color pallete, typographical & design elements and layout. This specific banner set offers high-resolution banners of 300 dpi. To know which type used for this design, the set gladly mentions the following fonts. The banners are fully layered for easy customization. 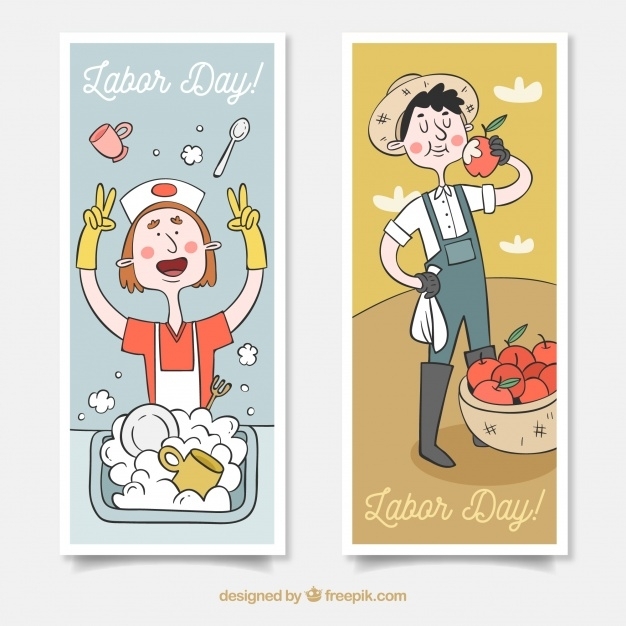 Similar to the first banner example, the Labor Day Banners best represents a variety of individuals in different fields, in this case, kitchen responsibilities and agriculture. The banner design is hand drawn which brings in simplicity and modesty to the subject. The banner designs could be utilized for celebratory displays, online and outdoor advertising and could be used as references for design projects be it art & design style, character design, illustration projects etc. May we recommend you to more labor day designs and themes? For an extensive selection, we have gathered Labor Day Posters & Flyer templates. Which will be of great use for quick options for invitations as well as for promotions be it online and outdoor advertisements. You may also utilize it for prototypes and future references.